President Maithripala Sirisena said during his tenure, he will take necessary steps to ensure that the Sri Lanka Police service is not only a nationally, but also internationally recognized service. 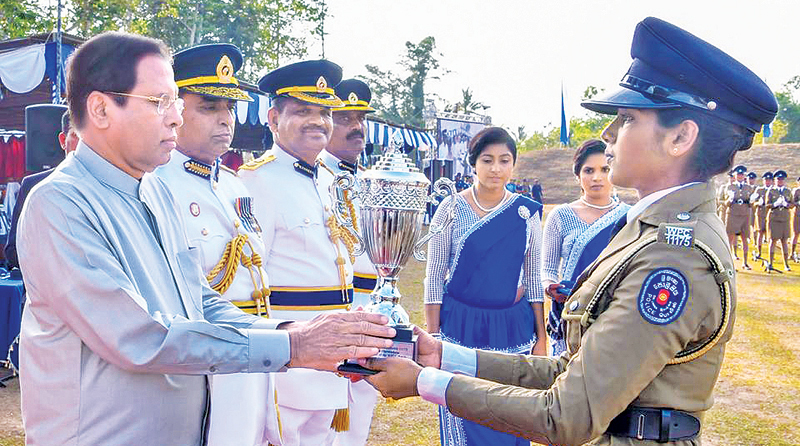 He was speaking at the Women Police Constables Passing Out Parade of the Sri Lanka Police College, Kalutara, on Monday. The President said the Sri Lanka Police service needs to be developed when compared to the police services of developed countries. He pointed out that during the last few months after he took the Police Department under his purview, he implemented many internal reforms for the Department with the aim of achieving that objective. The President also commended the service rendered by the Sri Lanka Police in the field of public welfare, going beyond the maintenance of law and order in the country. The President presented awards and certificates to women constables who had achieved outstanding performances. IGP Pujita Jayasundara presented a memento to the President. State Minister Ruwan Wijewardene, Deputy Minister Palitha Thewarapperuma, Rohitha Abeygunawardena, MP, Senior DIG S.M. Wickramasinghe, Deputy Inspector General Sanjeewa Dharmaratne and other officials participated in the event.